Powers/Abilities: Joseph "Wall-Eyed" Pike is a criminal with moderate underworld connections. History: (Daredevil I#165 (fb) – BTS) – Joseph "Wall-Eyed" Pike, nicknamed such because his eyes pointed different directions, was a second-rate criminal numbers runner and pool hustler. He worked with Flapjack and others in planning the acquisition of a shipment of Adamantium, one which had been stolen from a foundry in Pittsburgh. (Daredevil I#165) – At Josie's bar, Pike was hustling at pool with Dundee and others when Daredevil rushed in, demanding to know about the Adamantium. As the others fought the hero, Pike fled, rushing to Flapjack to escalate their plan. The next night, Pike and others were stealing items from a New Jersey plant when Daredevil attacked. 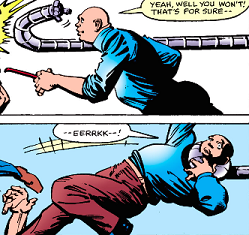 Pike rushed up to attack the hero but Dr. Octopus intervened, tossing Pike aside easily with a mechanical arm. 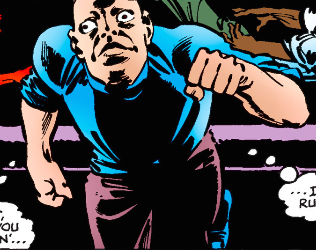 (Daredevil I#172) – Bullseye questioned Pike about the whereabouts of the Kingpin, threatening him with a pool cue. (Daredevil I#176 (fb) – BTS) – After beating Pike in pool, Stick won two hundred dollars off of him. Pike complained about it in the local bar. (Daredevil I#176) – Pike was home brushing his teeth when Elektra burst through his window, demanding to know where Stick was, and Pike gladly told her. Turk Barrett, wearing a suit of mech armor, bust through his wall and broke his bed, demanding the same information, and Pike gave him the same information. Pike took some antacids but then Daredevil broke through another window demanding the same intel. Pike packed a bag and, passing Snuff and Heather Glenn on the way out, gave them the same information on Stick. (Daredevil I#187 (fb) – BTS) – Pike set up a game of pool with Stick at Josie's. Stick didn't show up for the game at Josie's. As Josie and Pike watched, Daredevil came in to question Stick and several criminals attacked Daredevil. Comments: Created by Roger McKenzie, Frank Miller and Klaus Janson. (Daredevil I#165) – At Josie's, Dundee was playing pool with hustler Joseph "Wall-Eyed" Pike when Daredevil attacked, wanting information. (Daredevil I#165 (fb) – BTS) – Flapjack was among the criminals working with Joseph "Wall-Eyed" Pike in stealing a shipment of Adamantium out of Pittsburgh and seeking to smuggle it into New Jersey. (Daredevil I#165) – Pike warned Flapjack and his men that Daredevil was on to them so they accelerated the time table for their caper.